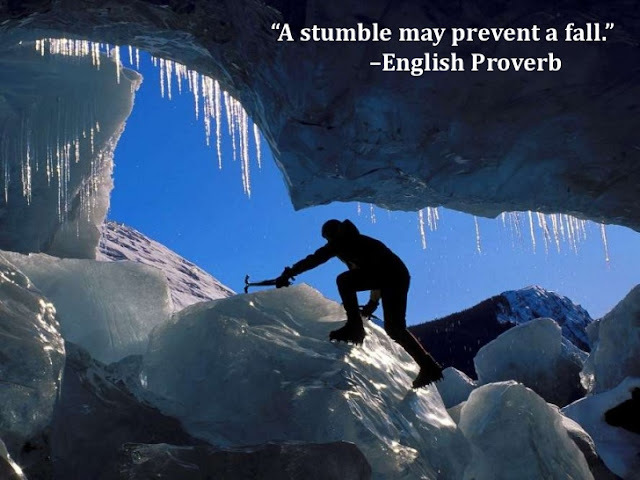 "A stumble may prevent a fall" - Thomas Fuller. Not all mistakes are bad. Being wrong sometimes is good. There will be times you need a rude jolt to become aware of a bigger danger. That is the stumble that prevents a fall. I frequently encounter this nowadays as I am constantly trying something new and stretching myself. There are occasions when a client draws my attention to a little embarrassing mistake and by the time I swallow my pride, apologise and fix it, I find out that there's something bigger that is responsible for it and should be taken care of first. There are also times when discussing with a client that I say something that is obviously wrong (and embarrassing) and this prompts the client to give me more helpful information that eases my life/work but wouldn't have gotten had I not made the little blunder. Increasingly, I am finding that being wrong isn't always bad. The lesson you learn might be 20 times of useful value than what you knew before the error. And in some cases, you might end up being right but just in the wrong way. And there are some things you can't be an expert at without those little embarrassing errors. In my training class, what wins the respect of my training participants are those little uncommon issues that I help them fix without coming over to the front of their PC. They were once the embarrassing issues I faced. Like the PivotTable field list disappearing. Mistakingly pressing a keyboard shortcut that has changed everything. Pasting not working after copying and entering a cell. Not seeing the Design and Layout menu after inserting a chart. And the little issues with some formulas. Just yesterday, another one happened. I was taking an in-house training for a company and no one seemed to be getting the explanations I was giving. It was seriously affecting my flow but it pointed me to a bigger issue: I had picked too complex set of examples and practice files. So I skipped lunch break, used it to build new practice files and everything changed. The class became lively instantly, they began understanding everything I was saying before and they felt happy by the end. Today, I will be ending the class, and hope to end on a very good note as I have fixed the bigger issue causing the little embarrassing awkwardness in the class. Being wrong is a feedback, and it always shows you a way to be better.